1.Dry roast the wheat flour for a few minutes. 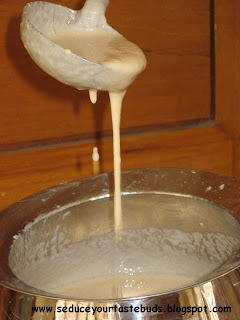 3.Take a laddleful and pour on a lightly hot griddle and spread it to a circle. 4.Drizzle oil and let it cook on medium flame. 5.When the edges turn brown,flip it over and cook it turn brown. For a tastier wheat dosa,add a few peppercorns,a little jeera/cumin seeds,finely chopped curry leaves,finely chopped green chillies to the batter and prepare the dosa in the same manner. 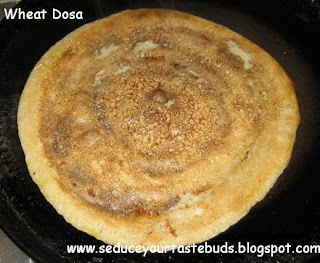 wow this is one healthy and tasty dosa that can be made quickly, nice entry! a good healthy dosa. we make it very often. Healthy dosa,I too make them,but I do not add rice flour,but it gives crispness ,right,lovely and waiting for the chutney recipe. A healthy and quick fix breakfast on no-batter busy days…I love this instant dosa and always have it with sugar!! 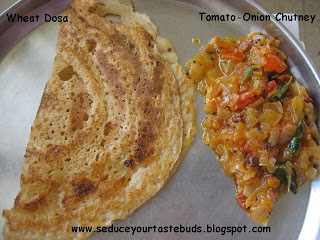 I make it often for my husband..So healthy..
PJ lovely dosa… :). I am also thinking of making this. good one. i tried to do this sterday…..but i dont know where i went wrong…..had tried a lot before….. Healthy dosa for everyone..looks yummy..